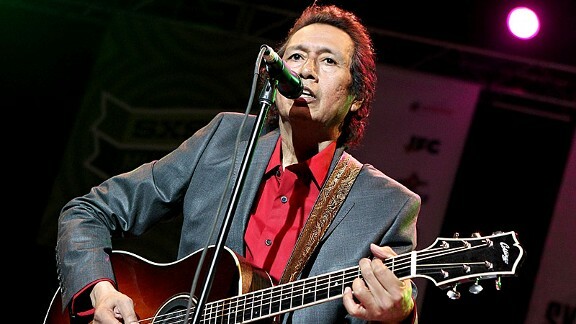 Alejandro started as a punk guitarist for the San Francisco band The Nuns, then moved to Austin in the ’80s to play with the more country-flavored Rank and File, and finally joined with his brother Javier and John Dee Graham to form the True Believers, which was his first songwriting vehicle. Since 1987 when that band broke up, he’s released 14+ solo albums of story-driven, lyrically intense, stylistically varied Texas rock. He was named “Artist of the ’90s” by No Depression magazine. We’ll be discussing “Beauty and the Buzz” (cowritten with producers Scott McCaughey and Peter Buck) from Burn Something Beautiful (2016), “Sally Was a Cop” (cowritten by Chuck Prophet and produced by Tony Visconti) from Big Station (2012), and “Pissed Off 2AM” (produced by Stephen Bruton) from With These Hands (1996). End song: “Velvet Guitar” (produced by Chris Stamey) from A Man Under the Influence (2001). Opening song: “Hard Road” by True Believers from their self-titled 1986 album , written with Javier Escovedo. Learn more at alejandroescovedo.com. The song “Castanets” is maybe his most famous. Here’s the same song live with Ryan Adams. Here’s the song “Wave” that I referred to as very explicitly a mini-movie; it’s part of a rock opera of sorts about the history of his family. Here’s his current band (with members of Minus 5) live. Here’s a current acoustic version of “Sally Was a Cop.” Here he is with Chuck Prophet, and playing the same song with Bruce Springsteen. Here he is on Conan in 1996. Here are the True Believers live, and here’s a whole 1978 set by The Nuns.